Sometimes people get bored and bored people start things, apparently without a motivation. Why? Probably to get out of this boredom. This is the message I wrote one morning. Hi people. I’m gonna steal some of your time. The idea is to involve the community and anyone who want to learn a technology by making a real project where experienced and junior dev can learn from each other. It is targeted to everyone want to experiment, learn, and get dirty. Anyone can participate (experienced, junior, curious) and the project will consist on creating a real project (more soon) based on the techs we love and we want to start using (e.g. ruby, react, redux, docker, ansible). A couple of months ago I was working on something (can’t remember what), to suddenly find myself into the Italian Ruby Mailing List writing the message above. You know. Pressing your keyboard, smiling, getting excited. Those stupid nonsense things. The message was a little longer, but that is not the point. Few minutes later I was thinking “what the hell are you doing? Don’t you already have enough stuff to work at?”. Of course the answer was… well, I didn’t have one. It was something popping out in my mind once more (the same idea were proposed 5 years ago, to failed after few weeks), I got excited, and I wrote. End of the story. In few hours many people replied showing the interest on learning together (73 replays in total) and around 15 people concretely joined. We soon organised a first call to know each other and to better understand what we wanted to do. Before the call I got little anxious. The problem with me (still) was that the “why” wasn’t clear, and to get started a project, I guess you should have some ideas of why you want to do it, and why other people should join you in this trip. I took a pen, a piece of paper and I started to write “why” such a project could make sense to me: which value could I get out of it?. Some motivations came out, but most of them were getting clear while talking with the other people who got interested to the idea. I’m now sharing with you our main motivations. Learn new techs by making a real project. Manage an highly distributed team with little time to dedicate. Exchange knowledge between people with different skills. Meet passionate people to share some passions with. Commit yourself on on taking some time to study a “cool” tech. It all started a couple of months ago (in January). We are making a call every week and use Slack for async communication. We plan to use Ruby, Rspec, React, Redux, Ava, Docker, Ansible and everything else could feel interesting to us. The first weeks has been crucial from an organisational point of view (as I said, this phase killed the idea once in the past), but we are still alive, and getting closed to the development phase. We are now defining a set of user stories on Trello for both backend and frontend and thinks are still exciting. We’ll also try to write a post per week to share what we are learning and to let you know if it is possible to learn by making a real project. Does all of this sound interesting? “Of course” I hear people saying. You learn, you get to know people, you make something out of nothing. Why in heart shouldn’t it be a success. Of course it’s nice… but maybe… you still have many things to do, you get easily bored, you like to move between things every week and much more. I find such a project not an easy thing to do. But we’re here to try. 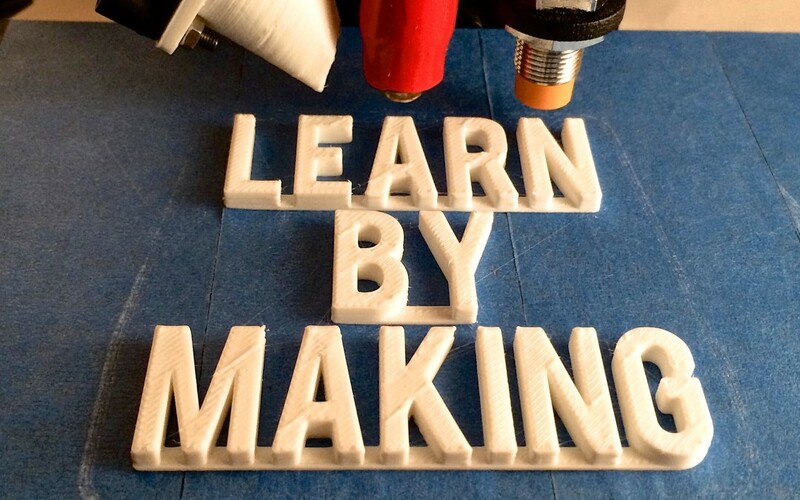 If you like what we are doing, get in touch with us and write to learning by making. We’ll be happy to share what we’re learning. And let us know your thoughts and your ideas on how to improve our chances to keep alive. Here some of the people who answered back to the call to action with some links to better know the people you could join. Andrea Reginato (lelylan, betterspecs, github, linkedin, twitter). Interested in Project Management, API Design, Continuous Delivery, Code Review. Roberto Piccini. Interested in Continuous Delivery, API Design, Backend, Backend Testing, Frontend. Nicolò Gnudi (github, twitter, stackoverflow). Interested in everything. Marco Brunet (linkedin, twitter, bitbucket). API, Frontend (web), Frontend (mobile), Reusable components, Versioning, Code Review. Luca Campli (github, linkedin, twitter, codepen). Interested in API Design, Frontend (web), Frontend Testing, Reusable components, Code Review. Iwan Buetti. Interested in Project Management, API Design, Continuous Delivery, Code Review. Maurizio De Santis (github, linkedin, stackoverflow). Interested in API Design, Backend API, Backend Testing, Frontend (web), Frontend Testing, Code Review. Maurizio De Magnis (github, stack overflow, twitter, google+, facebook, devlog). Interested in everything. Giuseppe Benfenati (linkedin, github, bitbucket). Project Management, API Design, Frontend (web), Frontend Testing, Reusable components, Code Review. Pierpaolo Sanna. Interested in API Design, API, Backend testing, Frontend (web), Frontend (mobile), Frontend Testing. Graziano Felline (github). Interested in API, Backend Testing, Continuous Delivery, Versioning, Code Review. Aaron Ciaghi (github, twitter). API Design, API, Backend Testing, Continuous Delivery, Frontend Testing, Code Review. Alessandro Verlato (github, twitter, linkedin). Interested in Project management, API design, API, Backend testing, Frontend (web), Code review. Alessandro Diaco. Interested in Design Prototyping, Frontend (Web), Frontend (Mobile), API, API Design. Francesco Scarfato. Interested in everything.